A gentle form of massage that uses long strokes, kneading, circular movements, vibrations and tapping to help relax and energize. A form of massage that uses slower and more powerful/forceful strokes to target the deeper layers of muscle and connective tissue. This form of massage is commonly used to help in recovery from injuries involving muscle damage. 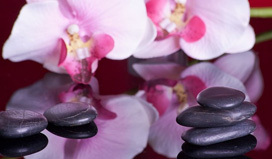 A specialty massage which involves the use of smooth, heated stones as extensions of the therapist's hands, or placed on parts of the body while another part is massage.